Alloy Yachts: 7th award for SY Vertigo in Florida! It’s been an astounding year for Alloy Yachts as the Auckland-based superyacht builder celebrates yet another major award – the seventh – for the 67.2 m (220 ft) ketch SY Vertigo with her owners and crew. Most recently, Vertigo was named best sailing yacht over 40 m by the International Superyacht Society whose annual presentation took place during the Fort Lauderdale International Boat Show at the end of October. 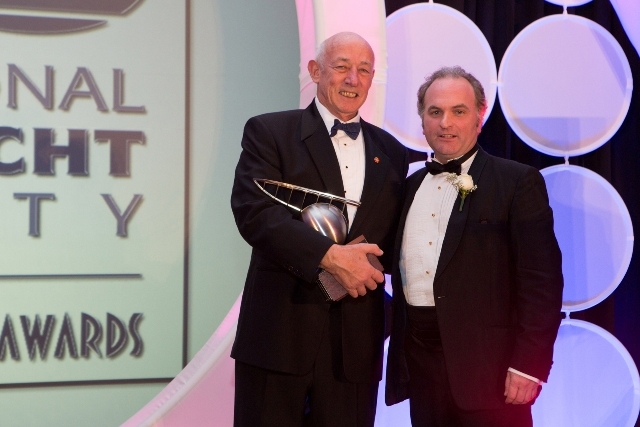 The photo (below) shows Alloy Yachts’ managing director Tony Hambrook being presented with the ISS award for best sailing yacht over 40 metres by American yacht designer Jonathan Quinn Barnett. In September, Vertigo was the toast of the 2012 Monaco Yacht Show, being presented with the prestigious Prix du Design (best in show) award. As part of the celebration, Tony Hambrook hosted HSH Prince Albert of Monaco onboard Vertigo, along with invited guests, industry leaders and the team from Alloy Yachts. Hambrook says the array of awards is testament to the yacht’s incredible design, workmanship, engineering and technological achievements.